Mild Cognitive Impairment (MCI) has been identified as an important clinical transition between normal aging and the early stages of Alzheimer's disease (AD). Since treatments for AD are most likely to be most effective early in the course of the disease, MCI has become a topic of great importance and has been investigated in different populations of interest in many countries. This book brings together these differing perspectives on MCI for the first time. This volume provides a comprehensive resource for clinicians, researchers, and students involved in the study, diagnosis, treatment, and rehabilitation of people with MCI. Clinical investigators initially defined mild cognitive impairment (MCI) as a transitional condition between normal aging and the early stages of Alzheimer’s disease (AD). Because the prevalence of AD increases with age and very large numbers of older adults are affected worldwide, these clinicians saw a pressing need to identify AD as early as possible. It is at this very early stage in the disease course that treatments to slow the progress and control symptoms are likely to be most effective. Since the first introduction of MCI, research interest has grown exponentially, and the utility of the concept has been investigated from a variety of perspectives in different populations of interest (e.g., clinical samples, volunteers, population-based screening) in many different countries. Much variability in findings has resulted. Although it has been acknowledged that the differences observed between samples may be ‘legitimate variations’, there has been no attempt to understand what it is we have learned about MCI (i.e., common features and differences) from each of these perspectives. 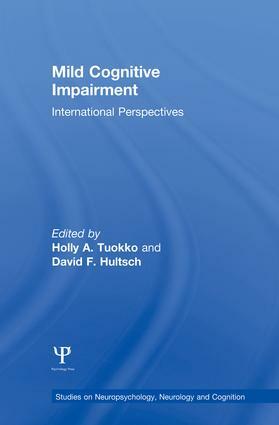 This book brings together information about MCI in different populations from around the world. Mild Cognitive Impairment will be an important resource for any clinician, researcher, or student involved in the study, detection, treatment, and rehabilitation of people with MCI. Part 1. Introduction. H. Tuokko, I. McDowell, An Overview of Mild Cognitive Impairment. Part 2. General Population Research on MCI. C. Fabrigoule, P. Barberger-Gateau, J.-F. Dartigues, The PAQUID Study. K. Palmer, L. Bäckman, B.J. Small, L. Fratiglioni, Cognitive Impairment in Elderly Persons without Dementia: Findings from the Kungsholmen Project. J. Fleming, F.E. Matthews, M. Chatfield, C. Brayne, Population Levels of Mild Cognitive Impairment in England and Wales. A. Collie, P. Maruff, D.G. Darby, C. Masters, J. Currie, The Melbourne Aging Study. Part 3. Specific Samples. R. Wilson, N.T. Aggarwal, D.A. Bennett, Mild Cognitive Impairment in the Religious Orders Study. G. Smith, M. Machulda, K. Kantarci, A Perspective from the Mayo Clinic. M.C. Tierney, Prediction of Probable Alzheimer's Disease: The Sunnybrook Memory Study. H. Wolf, H.-J. Gertz, Studies in the Leipzig Memory Clinic: Contribution to the Concept of Mild Cognitive Impairment. Part 4. Interventions. H. Chertkow, Emerging Pharmacological Therapies for Mild Cognitive Impairment. B. Woods, L. Clare, Cognition-based Therapies and Mild Cognitive Impairment. K. Peters, G. Winocur, Combined Therapies in Mild Cognitive Impairment. Part 5. Summary and Future Directions. H. Tuokko, D.F. Hultsch, The Future of Mild Cognitive Impairment.